We are all used to high quality connections when you want them. But this mousepad shows you how it was in the olden days. A phone switchboard with operator pushing the connection in when you needed it. Now this vintage look can be on your mousepad. 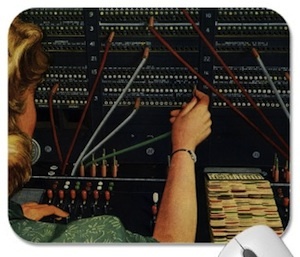 Go check out this Vintage Switchboard Mousepad. 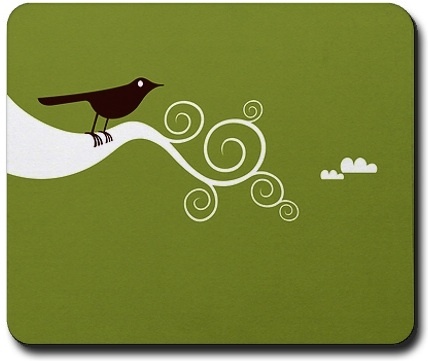 It’s a bird on a branch a great mousepad for people who like birds or like tweeting and think of birds that way. There are two kind of people one the once that like Android and the once that don’t. 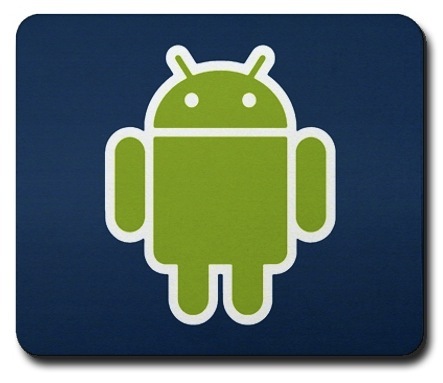 So if you like Android maybe you should make that clear to the people around you by getting a mousepad that says so. Go get your Google Android Mousepad before you switch! The Twilight Saga New Moon is popular to say the least so that is why I thought this mouse pad of the month should show you a New Moon Mousepad. 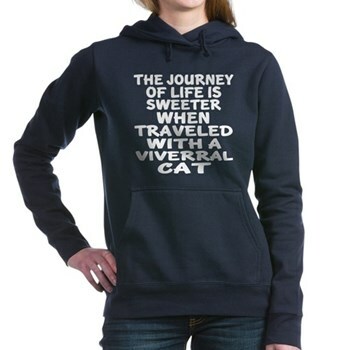 I found this other place with lots of new moon items for the fans out there. So like the New Moon Mousepad ? Games are getting faster and faster and that means that you need to mouse a lot faster to. And that is why the Handstand Zero Mouse pad comes in handy. 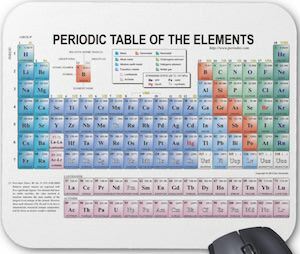 This mouse pad has two sides one for better accuracy and one for more speed. 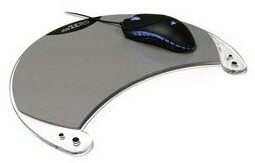 This is the mousepad a gamer need and you optical or laser mouse will love it. Check out the cool Handstands Zero Gamers Mat and gain the speed that you need. The last mousepad of the month for 2009 and next year I will try to get some more nice pads for everyone. And of course it is December and that means that Santa is coming soon to many many people all over the world. And I think that it could be nice if Santa would bring us a mousepad this chrismas. Have a look at the Home Time Christmas Mousepad and lets hope you find one under your tree. Thanksgiving in the US deserves this Mousepad and for everybody else the autumn leaves are a fun way to remember when you enjoyed going to the woods in fall and enjoy all those colored leaves. Nowadays we are all stuck in our offices and schools but still for this months mousepad of the month it would be nice to show you how nice it looks outside. 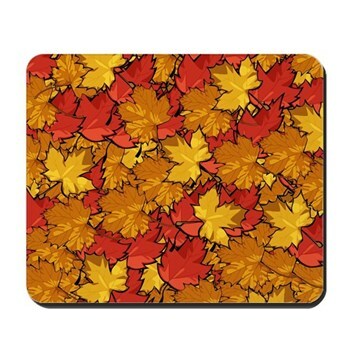 Go have a close look at the Autumn Leaves Mousepad and happy Thanksgiving. Halloween is on October 31 this year so why not have a mousepad that supports that. This months mousepad of the month is a little ghost that go’s trick or treating and man I wonder how much candy it will collect. 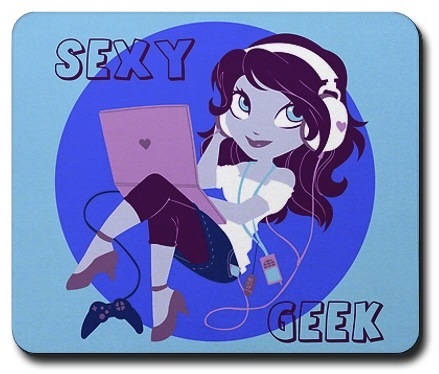 I personally like the artwork on this one and would love to get one myself so if anybody is looking for a gift for me then think of this little mousepad. 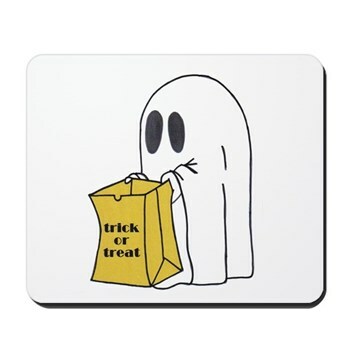 Go check out the Trick or Treat Ghost Mousepad and enjoy Halloween.